Incredible. The only word to describe what happened on Saturday November 12, 2016 at TD Waterhouse Stadium in London. The first five minutes of the game were all Mustangs in the historical 109th edition of the illustrious Yates Cup. From the opening kickoff returned into Golden Hawk territory, to the onside kick following the touchdown to give them a 10-0 lead before the Hawks offence could step onto the field. After trading field goals on the ensuing drives, the Hawks, down 13-6, took over the rest of the first half. Levondre Gordon with a 42 yard touchdown run and two more field goals had the Hawks up 19-13 at the half and stunning the crowd of over 4100 in attendance on the campus of the University of Western Ontario. However, the third quarter did not go the Golden Hawks way. Western scored 27 unanswered points to take a commanding 40-19 lead over the Hawks and put the proverbial “Nail in the coffin” of the Laurier team. Que Michael Knevel. Making just his second ever playoff start in the OUA and just his 7th career start for the Golden Hawks it was Knevel who needed to take over the game if the Hawks were going to comeback. On 2nd and 10 Knevel was sacked for a loss of 18 and the Hawks faced a daunting 3rd and 28 situation and their season was on the line. Knevel put a jump ball up near the sideline in the end zone and coming down with it was 2nd year receiver Brentyn Hall, making a miraculous play to bring the Hawks within 14 points with 8 minutes remaining in the game. After a 2 and out by the Mustangs, Laurier drove the ball deep into Western territory, and on another 3rd down attempt it was Knevel finding Carson Oullette over the middle, making a handful of Western defenders miss and bringing the Hawks within 7. After a deep kickoff by Nate McLean, OUA All-Rookie, the Mustangs were able to convert on one first down but on 2nd and medium in their own end, OUA Defensive Player of the Year Nakas Onyeka forced Alex Taylor to fumble in his own zone allowing Isiah Messam to scoop the ball up and bring it down to the Western 3 yard line. Knevel then found Kurleigh Gittens Jr with a beautiful back shoulder fade in the corner of the end zone and following the Nathan Mesher extra point, the 109th Yates Cup was tied at 40-40. The best defence in the country plays out of University Stadium on the campus of Wilfrid Laurier University. When the Mustangs needed a late drive they couldn’t find a way to get a first down. Forced to punt, Carson Oullette returned the ball 17 yards in Western territory, giving the offence a chance to put the ball in range for Nathan Mesher to win the game. Levondre Gordon on 2nd and 5 scampers for a 31 yard gain down to the Mustangs 15 yard line, putting Mesher well within his range for the game winning field goal. Mesher was 5 of 10 for field goals in the regular season, however in just two playoff games heading into the game winning attempt he was 6 for 6 as he had already made 4 field goals earlier in the game. 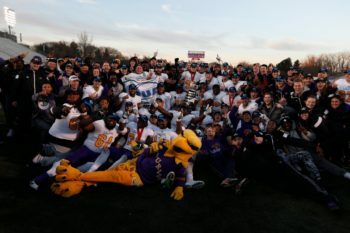 A great snap by OUA Second Team All-Star Jamie Lalonde and a perfect hold from 4th year receiver Markus Arkarakas allowed Mesher to hit the 26 yard field goal with no time remaining and give Laurier their first Yates Cup Championship since 2005 when they won the Vanier Cup. That 2005 team defeated McMaster in the OUA semi-final, Western in the Yates Cup (Same as 2016). They also won the Uteck Bowl on the road (2016 they will travel to play Laval in the Uteck Bowl) before defeating the Mitchell Bowl champions in the Vanier Cup in Hamilton (Same location this year). The comeback win marks the largest come from behind victory in Yates Cup history as the Hawks scored 24 points in 8 minutes to claim the schools 8th championship in program history. Want to hear more analysis on the game? Tune into Hawk Eyes Monday at 6:00pm as Jason Hagholm, Lauren Hunter and Jack Moore break down the game and what the Hawks need to do to advance to the Vanier Cup as they take on the 8 time Vanier Cup champions and the 13 time Dunsmore cup champion Laval Rouge Et Or on Saturday November 19, 2016 at Telus Stadium in Quebec City. The game can be seen on Sportsnet 360 at 12:30.
do you store your shows on podcast?